Alameda CTC is the project sponsor for the East Bay Greenway: Lake Merritt BART to South Hayward BART Project (Project). The Project proposes to construct a bicycle and pedestrian facility that will generally follow the BART alignment for a distance of 16 miles and traverse the cities of Oakland, San Leandro, and Hayward as well as the unincorporated communities of Ashland and Cherryland. The Project connects seven BART stations as well as downtown areas, schools, and other major destinations. In September 2014, Alameda CTC leveraged available local Measure B and BB funds and was awarded funding from state Active Transportation Program (ATP) towards the environmental clearance for the Project, which involves securing State and Federal environmental clearance under the California Environmental Quality Act (CEQA) and National Environmental Policy Act (NEPA) respectively. Alameda CTC is the lead agency for CEQA and Caltrans is the lead agency for NEPA. The cities of Oakland, San Leandro and Hayward, Alameda County, BART, the East Bay Regional Park District, and Caltrans are participating in the development of the project. The Draft Initial Study and Mitigated Negative Declaration (IS/MND) was released on October 23, 2017, and the public was provided 30-day review period as required by CEQA. The comment period closed on November 21, 2017. Alameda CTC conducted four Project Information Meetings regarding the Project, in the cities of Hayward, Oakland, and San Leandro. Participants had the opportunities to review displays, watch a multimedia presentation, interact with project team members, and submit written comments. Additionally, Alameda CTC used several methods to solicit comments on the IS/MND including posting of notices on the Alameda CTC website and social media; posting flyers at local libraries; sending E-newsletters or E-blasts to stakeholder groups (elected officials, stakeholder agencies, and interest groups and individuals); and advertising in local newspapers for circulation in nearby communities. The Final IS/MND includes minor revisions and/or modifications since the release of the document for public review. None of the modifications noted result in “substantial revision” to the Draft IS/MND, requiring recirculation. Rather, the changes in the Final IS/MND provides clarifying information (“merely clarifies, amplifies, or makes insignificant modifications to the negative declaration”) as specified in §15073.5(c)(4) of the CEQA Guidelines. The Alameda CTC Commission adopted the IS/MND at its meeting on March 22, 2018. Alameda CTC is the project sponsor and lead agency for state environmental clearance pursuant to the California Environmental Quality Act (CEQA) clearance. Caltrans is the lead agency for federal environmental clearance pursuant to the National Environmental Policy Act (NEPA). Other project partners include: the City of Oakland; the City of San Leandro; the City of Hayward; Alameda County; BART; and the East Bay Regional Park District. What is the status and schedule for the project? The project is currently in the preliminary engineering and environmental analysis phase. On October 23rd, 2017, Alameda CTC published a CEQA Initial Study and Proposed Mitigated Negative Declaration (IS/MND) and held a thirty-day public comment period. A Final IS/MND was certified in March 2018. A NEPA Categorical Exclusion is in progress and will be completed by summer 2018. The project corridor has been segmented to allow design, and eventual project construction, to proceed once constraints, such as right-of-way availability, jurisdictional readiness, and funding are resolved. Design and construction for major transportation projects can take several years, but these activities can occur in phases, so that some segments can be opened to the public in the near-term. How is the project related to the segment of trail near the Coliseum BART station? 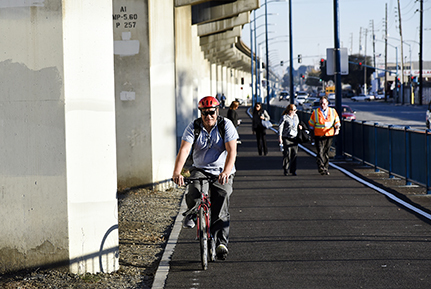 An initial segment of the East Bay Greenway was constructed from 75th Avenue to 85th Avenue near the Coliseum BART station in Oakland to take advantage of a federal grant obtained by the East Bay Regional Park District. The current Project will connect this half-mile segment to the overall 16-mile corridor. Does the project require property acquisition? Most of the project falls within existing pubic property or UPRR right of way with varying acquisition needs along the corridor. A clear understanding of the property impacts will be identified following the conclusion of the discussions with UPRR and a design option is moved forward. What design options are under consideration? Two design options to bookend potential impacts are under consideration for environmental analysis purposes. The design options are differentiated by the degree to which they encroach into UPRR right-of-way, and both require some railroad right-of-way. The final trail alignment will fit within the envelope of the two design options and will be based on right-of-way availability, funding, schedule, engineering feasibility, and the ability to generate larger regional benefits. A Rail-with-Trail option would construct a trail adjacent to the rail line while preserving rail operations. The trail would comply with minimum setback requirements and fencing would be provided to separate users from the active rail line. A Rail-to-Trail option would involve abandonment of the rail line and conversion to a trail facility. The final trail alignment will be based on many considerations including right-of-way availability, cost, schedule, engineering feasibility, quality of facility, and ability to generate larger regional benefits. How will the project ensure safety for users? All trail designs and street crossing treatments will meet adopted engineering standards. The trail will also include safety and security features such as lighting, barriers, and fencing to ensure the safety of both trail users and adjacent properties. What are the impacts from the trail? Because the project is not expected to result in significant or unmitigable environmental impacts, Alameda CTC is pursuing an IS/MND for CEQA and a Categorical Exclusion for NEPA. The Project does not result in any unmitigated significant impacts. Environmental categories that are reduced to less than significant with mitigation include: Aesthetics, Mandatory Findings of Significance, Hazards and Hazardous Materials, Biological Resources, Cultural Resources, Noise, and Air Quality. The Project does not result in significant impacts to traffic operations along the Project corridor and would implement improvements to roadway lane geometries, intersection signal timings, and lane width reductions. The Project has no impact on parking supply and demand. Parking displaced from the corridor can be relocated to other available curb spaces in the immediate area. How will the trail be maintained and operated? Alameda CTC is working with project partners to determine the most appropriate arrangement for maintaining and operating the trail that will be finalized once a design option is selected. The project cost (including design, construction and contingencies) is estimated at $161 million for the 16-mile project corridor. The right-of-way cost could range from $14 million to $228 million and is subject to discussions with UPRR. The environmental phase activities are fully funded by an Active Transportation Program Cycle 1 federal grant, which has been supplemented by Measure B and Measure BB local transportation sales tax funds. For future phases of the project, Alameda CTC will leverage Measure BB funds to pursue grants at the regional, state (i.e. Senate Bill 1) and federal levels. Will there be contracting opportunities or jobs on the project? Depending on the availability of funding, contracting opportunities will be available for the corridor as a whole or by segments after the environmental process is concluded. Those opportunities will be subject to the US DOT’s Disadvantaged Business Enterprise program or Alameda CTC’s Small and Local Business Contracting Equity program depending on the specific funding sources and may include professional services and construction work. How can the public provide input and stay informed on project updates? Updates will be posted at the project webpage at alamedactc.org/eastbaygreenway. The project team will seek public input on details associated with the final alignment during in future design phases and will advertise these opportunities as they are developed. In addition, the project team provides updates to the Alameda CTC Bicycle Pedestrian Advisory Committee and Programs and Projects Committee in an open forum as project development progresses. Notice of Intent to Adopt The Draft Initial Study and Mitigated Negative Declaration (IS/MND) was released on October 23, 2017, and the public was provided 30-day review period as required by CEQA. The comment period closed on November 21, 2017. View the Notice of Intent to Adopt/Notice of Availability. Conceptual Designs Alameda CTC has developed conceptual designs to support the environmental analysis. In general, the bicycle and pedestrian facilities along the corridor will be either a Class I (multi-use path) or Class IV (separated bikeway) as determined by the location and constraints. The Project would also include crossings including traffic control and other modifications to ensure safe and accessible operation; connections to existing sidewalks and pathways along the project corridor; lighting, fencing, barrier railings, and other features needed to ensure safety and security. Landscaping features will vary depending upon each jurisdiction’s maintenance and operational needs. It is anticipated that more robust features will be addressed by each jurisdiction through independent local projects. For approximately 12 miles of the corridor south of 47th Avenue in Oakland, the Project is shared by Union Pacific Railroad (UPRR) Oakland Subdivision, an active freight rail line. The environmental clearance approach for the Project incorporates the phased implementation of the Project corridor on a segment-by-segment basis to allow design, and eventual project construction, to proceed once constraints, such as right-of-way availability, jurisdictional readiness, and funding are resolved. The environmental document addresses both options shown below. Rail-to-Trail option assumes that the Oakland Subdivision would no longer have active rail service and the full right-of-way is available for the Project. Under this option, existing railroad bridge structures at creeks and major roadways could be retrofitted as trail crossings, surplus right-of-way not needed for the trail could be repurposed for other uses, and the trail cross section could be designed in an unconstrained manner. Rail-with-Trail option assumes that the Oakland Subdivision remains active and a trail is constructed in the corridor alongside the rail. The rail-with-trail option would meet all California Public Utilities Commission (CPUC) requirements for setbacks and assumes that fencing to separate trail users from an active rail line would be provided. The rail-with-trail assumes the minimum possible encroachment into UPRR right-of-way possible while still constructing a continuous facility in the BART/UPRR corridor.